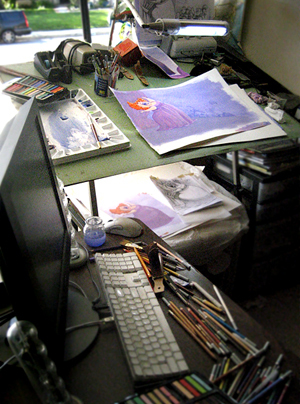 Although there’s a bit more to the office/studio I share with my hubby, this here would be the part I stare at most of the day… sometimes blankly, sometimes sobbing with tears of frustration and sometimes cranking away feverishly on a plum project. I do most of my illustrations digitally. However, there are times when a little painting, a little pastel, or perhaps a bit of graphite is in order. This is when I retire to ye ole garage studio… unless, of course, it’s a triple digit summer day. On those days I stick with digital, to avoid sweating profusely and consequently causing unsightly smearing on the artwork. I’ll tell ya, it’s nice having the choice and the space to do it in. This entry was posted on March 26, 2010 at 10:40 pm and is filed under Today's Special. You can follow any responses to this entry through the RSS 2.0 feed. You can leave a response, or trackback from your own site. Love it Linda… especially that green one eyed creature mug!! Thanks, Roberta! Yes, that one-eyed creature mug and I are constant companions. He supplies me with creative juices, A.K.A. : caffeine! Very nice. 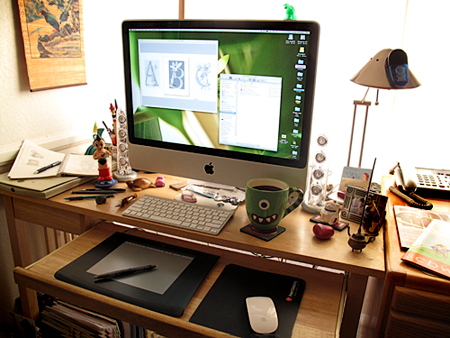 I always enjoy seeing others’ work spaces. Your monitor is MASSIVE! Its good to hear that other people cry with frustration sometimes! Nice studio! Thanks! Kate, it really is a nice size, it’s a 24″ iMac. I was against it at first… I felt it would be weak compared to a tower… but it’s fantastic and very powerful. Of course, Tom sits next to me with a 30″ monitor which dwarfs mine. Show off!